I had a look at all the others that are up on Tims Blog and they are just incredible. I like the way you have taken his Tag and taken a different approach, but still including adding similar elements and technique. Yours has movement and tactual, it is also beautifully inked. It is so beautiful Tag. It's so genial and gorgerous. The background is really stunning. All elements are fantastic. Gorgeous tag! Happy Thanksgiving to you & your family. Love it. Even better than Tim's. (Do I dare say that?) Happy Thanksgiving. Gorgeous tag! Enjoy your day. I love your take on Tim's tag..colors,layout, etc. Happy Thanksgiving! That is just stunning, hon. LOVE the rich colors and your chosen embellishments. Happy Thanksgiving! A really fabulous with wonderful vibrant seasonal tones and inks. 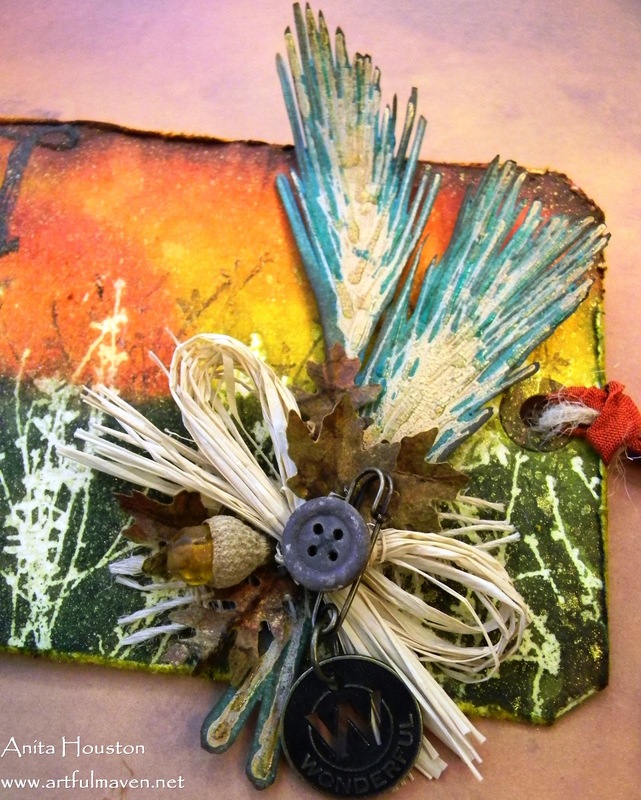 The embellishment is gorgeous and adds great texture and detail. Thanks so much for joining in the Simon Says Stamp and Show Challenge. Sarah. What a stunner! 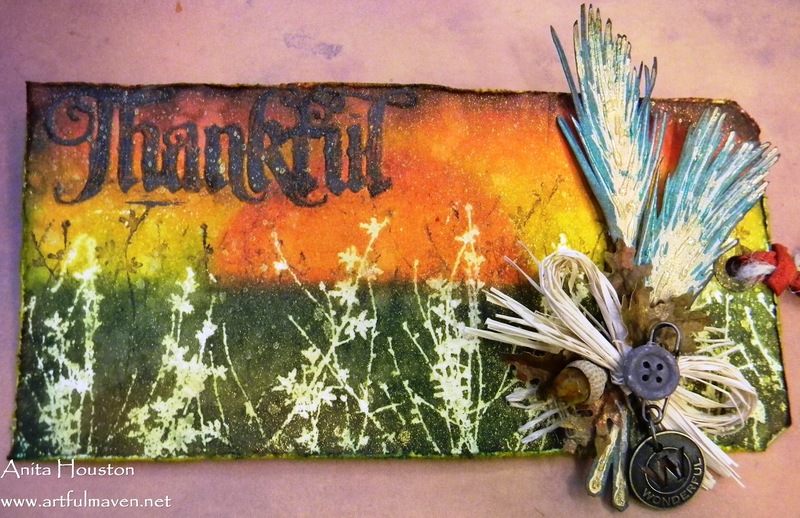 I love the colors and those fabulous stalks of wheat tied under that ribbon! Just gorgeous! Happy thanksgiving! Fabulous Tag dear!! I love it!! Wishing you and yours a Happy Thanksgiving!! So far all is going well with my brother so keep your fingers crossed!! enjoy and thnx for the wonderful inspiration you give!!! 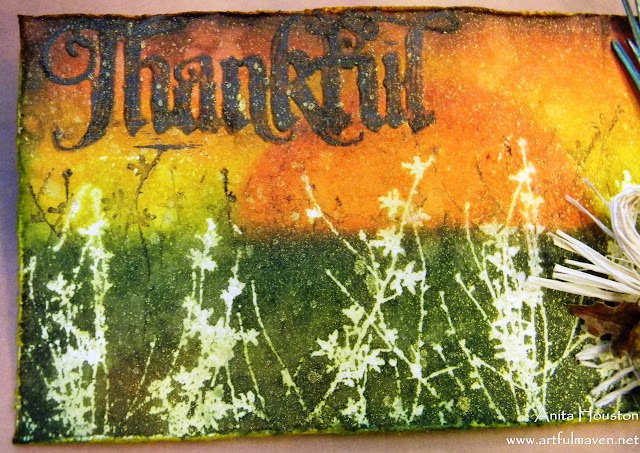 That rocks, such a fantastic tag, love the bright colors and all the elements. Totally gorgeous tag - the hedgerow flowers silhouetted against that glorious background are perfect, and what a gorgeous tiny bouquet of autumnal gatherings! Hope you have a wonderful family celebration this weekend... I'm thankful for you and all the inspiration and support you provide. A wonderful take on tims piece. Such vibrancy and glorious colours. 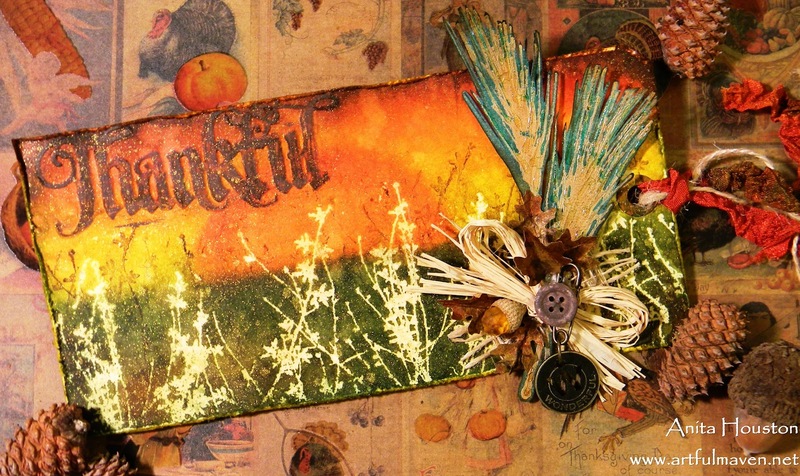 Fabulous Thanksgiving tag Anita. Love the colours and techniques. Stunning embellishment. I really like that you oriented your tag horizontally.Very nice interpretation of the original! And thanks for the printer friendly button on you blog. I never noticed it before! Gorgeous tag Anita, Great photography skills too. The muse token says it all. It's wonderful. Gorgeous colours and the embellie cluster is fabulous. Very cool tag! This is just fabulous. 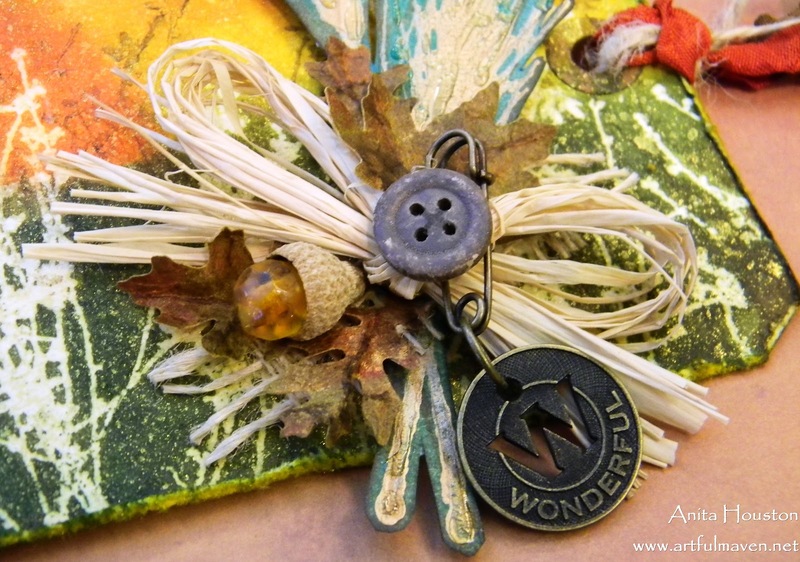 I love the gorgeous sunset/sunrise in the top half of the tag...it makes my heart rise...then those glorious backlit botanicals make it soar...and the shimmering sheaves of wheat adorned with the acorn and baubles...perfect, Anita....the colors, the embellies, the vibe. It's so uplifting...and that is what I love about your art! This is just beautiful. I love the beautiful white foliage at the bottom and how they seem to be lit from behind. The acorn, rafia and leaves are also just gorgeous.